As you already know we specialized in teaching Portuguese to foreigners coming from all over the world. We do not teach any other language and we put all our efforts into teaching Camões language to our dear students. If you live in Lisbon and have a busy schedule during the day, our Extensive Courses might be the perfect solution for you! Classes take place twice a week from 7pm to 9pm for a total of 30 hours. This month we opened several extensive courses for different levels, A1.1, A1.2, A2.2, B1.2 now it's time for the A2.1 level. 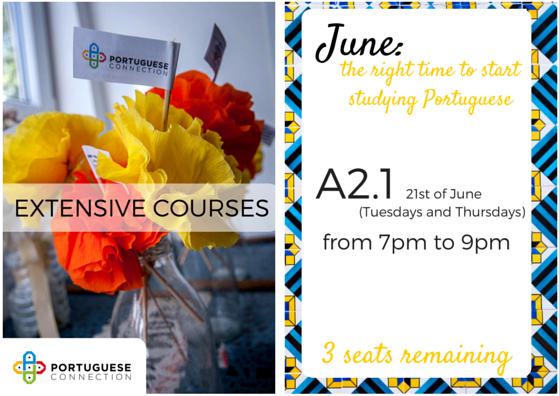 You will have to hurry up if you want to save a seat as the course will start next Tuesday (June 21) and we only have three seats available. Classes will take place on Tuesdays and Thursdays from 19h00 to 21h00 and will end on August 9. In this course you will learn how to express yourself in the past and in the future tense, how to give suggestions and make plans and a lot more. All the learning and writing material is provided by the school, you just have to bring good mood!